"This is similar to many recipes I've found, but adjusted to my family's tastes." Heat 2 tablespoons oil in a large saucepan over medium heat. Saute onions until tender. Stir in rice and brown slightly. Add 3 1/2 cups water, and half of the lemon juice. Reduce heat, cover and simmer for 20 minutes, or until all liquid is absorbed and rice is tender. Stir in dill, parsley and pine nuts. 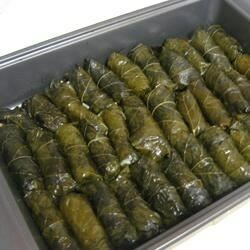 Remove stems from grape leaves and place 1 tablespoon of rice mixture in the center. Fold in the sides and roll tightly. Place, folded side down, in a baking dish and cover with remaining olive oil, lemon juice and enough water to cover 1/2 of the dolmathas. Cover with aluminum foil and bake in preheated oven for 45 minutes. SO DELICIOUS ,IF YOU WANNA TRY SOMETHING ZAZZY AND DIFFERENT I DO RECOMMEND THIS ONE. I was leary of the combination of spices but as it was coming together, it smelled SO good. This is a great recipe and I had no problems with it. Yummy. Will definitely make again. Not quite what I was hoping for. Followed the directions exactly and they seemed to come out a bit too oily for my taste. I'll keep looking!